Attachments adapt a driver/extractor to fit a particular pile type, such as an H-beam, steel sheet pile, or pipe pile. Most vibratory pile driver/extractors come equipped with the APE standard universal clamp that has the ability to fit double sheet piles and H-beams. The universal clamp can be quickly adapted to fit flat plates or small diameter pipe piles including train rail. APE can also manufacture adapters to mount competitor attachments on APE hammers and APE attachments on competitor equipment. APE manufactures attachments for every type of pile, yet all APE attachments use the same mounting bolts, so contractors don’t experience delays in the field due to improper bolt sizes. APE clamp cylinders are machined from solid blocks of steel for maximum strength and durability. 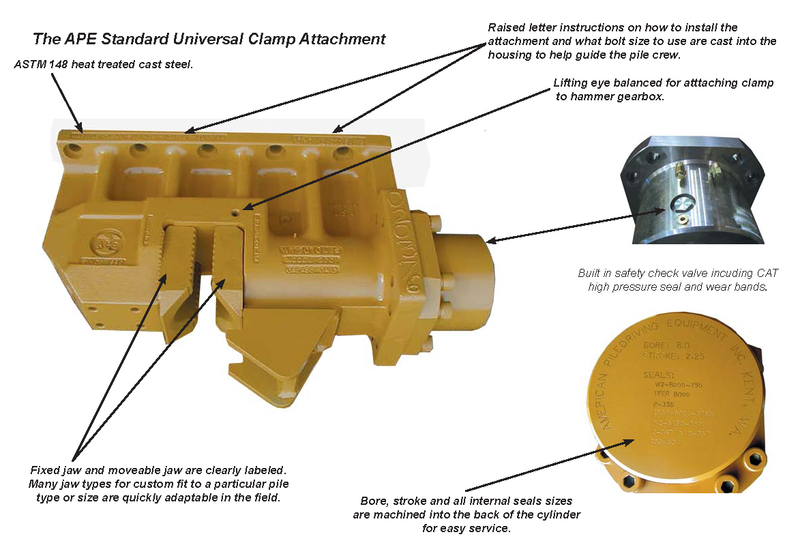 Safety check valves keep the jaws closed even in the event of a hose failure and every seal in the clamp is listed on the cylinder. NEVER USE ANY PIECE OF APE EQUIPMENT AS A LIFTING DEVICE. ALWAYS HAVE A SAFETY LINE ON THE PILE.